Apparently not enough people believed in it. She’s right. WWII ended in 1945, she was born in 1971. Men last walked on the Moon in 1972, Cat was born in 2010. Incredible! Only eight of the 12 men who have walked on the Moon remain alive now. Oddly, I’m not all that concerned. Of all the foodie blogs I read, Smitten Kitchen is my favorite, which is saying a lot, as this is an excellent time for foodie blogs and even just recipe sites. The reason I like Smitten Kitchen so much is that unlike a lot of the other blogs, they usually keep it pretty straight forward, but usually giving you something new and interesting at the same time. 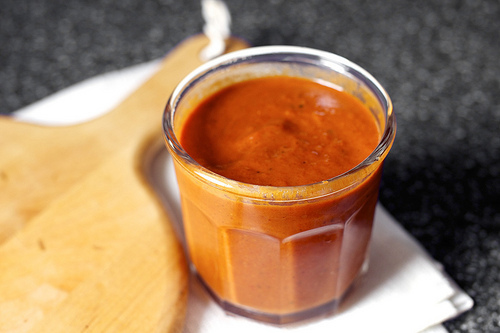 Take this recipe for a steak sauce! I normally don’t give steak sauce a second thought (Worcestershire or A1) but even though this has a fair amount of ingredients I am intrigued by the tastes here. You can read the whole procedure over there but I like the idea of all these flavors! Tomato puree, orange juice(! ),Worcestershire,ground ginger, molasses, allspice, ground mustard, balsamic vinegar, pepper,salt,onion powder and olive oil, not to mention a charred red pepper! Plus the article gives me the idea of putting this on a number of things, from potatoes to scrambled eggs to maybe a simple hamburger. Making one’s own sauces….I hadn’t given it much thought but it seems intriguing. I will make this (anyone have some allspice and ground ginger?) and let you know how it works out. Go ahead…take your dog dancing! I know this is CatVille…but this is for the DogPeople….If you can’t get your puppy to do this, Elanor Powell does it for you… nice ending!